The front seven defenders work out today, who to watch, and which drills matter the most for Defensive linemen and linebackers. Sunday sees the deepest position group in the 2016 NFL Draft take the field at the Nfl Scouting Combine. This year's defensive line class, particularly the defensive tackles, is absolutely stacked with big, athletic, monsters. There are also a bunch of intriguing linebackers who will be working out as well. Since the New York Giants' front seven needs reloading, today might be the most important day of the combine for Giants' fans. Defensive Tackles - All of them. With 10-12 potential first-round talents alone, it would be pointless to emphasize a couple tackles from this class. Watch them all, because there will be some great players on display. Carl Nassib - He isn't being talked about among the top edge rushers in the draft (although I believe he should be), Ryan Nassib's bigger younger brother was the most productive Pass Rusher in the country, and notched more than a sack a game. He has a good first step and checks every Giants' physical box at 6-foot-7, 277, with 34.5-inch arms, 10 3/8-inch hands, and a reputation for a ferocious work ethic. The Giants have already met with Nassib at the Combine, and his relationship to their back-up quarterback means they should have the best scouting report on Carl of any team in the NFL. Shaq Lawson - A common pick for the Giants in early mock drafts, Lawson's draft stock has slipped lately. His drop has largely been due to evaluators getting a better look at some other prospects and questions regarding his athleticism. Like Nassib, the Giants have already met with Lawson. If he can have a good showing in the drills, Lawson could re-enter the conversation for a top-10 pick. Emmanuel Ogbah - At one point Ogbah was a strong consideration in mock drafts along side Lawson for the Giants, but like Lawson, his stock has slipped as others' has risen and questions about his quickness and agility have come up. Ogbah was very productive for Oklahoma State, but he was primarily a power rusher who would overwhelm college tackles over the course of a game. He will need to show that he has the ability to beat NFL tackles with speed. Noah Spence - Every team in the league has met with Spence regarding his history of drug use, and the Giants are one of them. Spence might be the best pure pass rusher in this draft, and showed the burst, speed, agility, power, and bend to be a dynamic edge rusher in the NFL. At 6-2, 251, with 33-inch arms and 10 3/4-inch hands, and putting up 25 reps on the bench press, so far he is eerily similar to Khalil Mack (6'3", 251lbs, 33 1/4", 10 1/4", 23 reps). If he can finish his workout like the two-position All-Pro, Spence could become one of the hottest prospects in the draft. Deion Jones - From a historic point of view, Jones is a very undersized linebacker. However, with the need for athletic coverage over the middle, Jones is becoming more of the prototype for an NFL coverage linebacker. 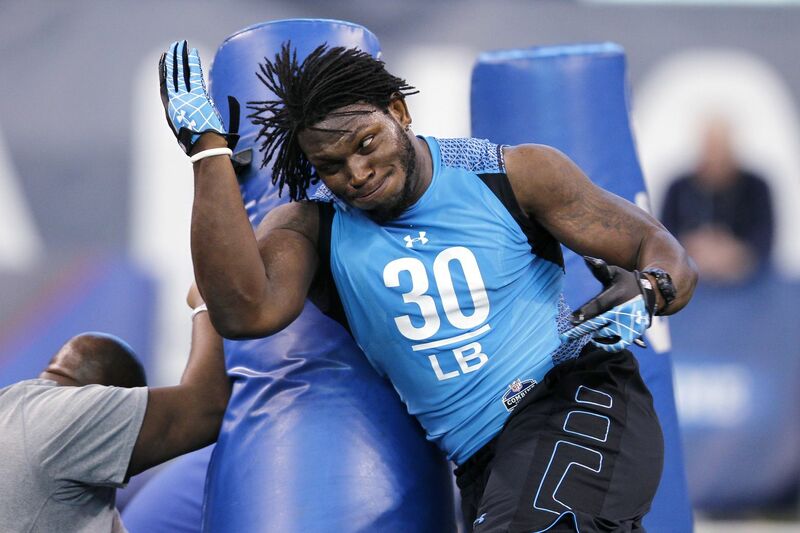 At 6-1, 222 pounds, Jones is highly athletic and capable of covering a lot of ground over the middle of the field. Similarly, Darron Lee (Ohio State) and Su'a Cravens (USC) bear watching as well, and all three could go in the first two rounds. Dominique Alexander - With Jon Beason retired, and Jasper Brinkley no lock to be back in Blue, the Giants could look to Alexander to man the middle of their defense. While the Giants haven't been linked to him yet publicly, they did have credentialed scouts at several Oklahoma games this year. Alexander is a bit undersized, but he is a good coverage linebacker who is also stout against the run, provided he gets protection from the defensive line. Alexander is also durable, starting 33 consecutive games inside for the Sooners. 3-Cone Drill - The Giants have powerful players in their front seven. What they need are players with the speed and agility to quickly beat blockers and be disruptive in the backfield. The 3-cone drill has a positive correlation with a player's ability as a pass rusher. If they have the agility and flexibility to score well in this drill, they have a better chance of being able to beat an offensive tackle around the edge. 10-yard split, vertical, and broad jumps - The 40-yard dash is less important for front seven players -- although coverage linebackers need to score well -- than the first 10 yards. How players start gives an indication to their first step and ability to beat blockers off the snap. The jumping events show whether or not a prospect has an explosive lower body. Lower body explosiveness is often translated into power.